Last night I watched the BBC 1 documentary called 'Wootton Bassett - The Town That Remembers', which looked at the way the town has honoured the war dead. I knew that it would upset me, and sure enough it did. It was an extremely moving piece of television, and being the old softy that I am under the surface, I spent the whole programme dabbing my eyes with my handkerchief. The programme was focusing on the living, but all I could really think about were the dead. As many of you are probably aware, Wootton Bassett is a small market town in Wiltshire, with a population of just over 11,000. 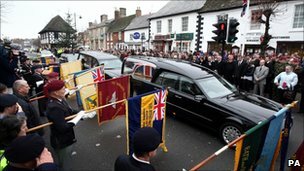 It started to come to prominence in April 2007 when the residents began to solemnly and quietly stand at the side of the road to pay their respects to the war dead, who's coffins were passing through the town on their way from RAF Lyneham. The bodies of fallen soldiers arrived at the air base, and were driven through Wootton Bassett on their way to the mortuary at the John Radcliffe Hospital in Oxford. Repatriation flights, as they are called, will cease to land at RAF Lyneham from about September 2011, as the air base is due to close in 2012. All flights we be transferred to RAF Brize Norton, which is in Carterton, about 22 miles west of Oxford. It is unlikely that we will see many more days as we have in Wootton Bassett, as the route from RAF Brize Norton to the mortuary in Oxford does not pass through any towns or villages. Some residents apparently will not be too disappointed about this, as they feel it has become too much of a media event, and has attracted what they call "grief tourists". These views may well be in the minority, and though the programme revealed that there was perhaps more organisation needed than I would have at first thought, the dignified respect for those who had died, and the support given to grieving families will be missed. One side effect of these days is that it helps to keep in the public eye, the constant death toll as a result of war, and without it, we might just be left with hearing a brief statement from the Prime Minister at the beginning of Prime Minister's Question Time every week - an altogether more limited audience. I'll come to my feelings about war in a moment, but the harsh reality is that we are engaged in wars, and as a result of the inevitable deaths that occur, Wootton Bassett residents should be remembered for their dignified actions. It seems that the Queen agrees, as she has conferred on the town the name Royal, so from later this year the town will be known as Royal Wootton Bassett. I have no idea what this means, or whether there are any perks associated with it, and to be honest, I haven't enough interest in the subject to look it up. 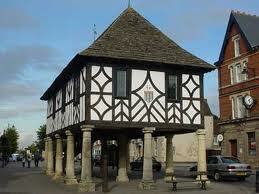 Did you know though that there are only two other towns in England that are Royal towns? They are Royal Leamington Spa (given the title in 1838) and Royal Tunbridge Wells (given the title in 1909). Also, never one to miss an opportunity to mention Wales, Caernarvon in Wales is a royal town of a different kind. "The Royal Town of Caernarvon" was made a Royal Borough by the Queen in 1963, and was allowed to retain the honour when it ceased to be a borough in 1974. Not quite in the same league that one I think. That's the niceties over with. Repatriation happens because of dead soldiers. Dead soldiers happen because of war. War happens because someone decides to make that decision. In the last ten years, we have gone to war in Iraq and Afghanistan. So that you know where I stand, I opposed going to war in both countries. We went into Iraq in March 2003, to deal with Saddam Hussein's 'Weapons of Mass Destruction' - which we never found. Tony Blair, at the Chilcot inquiry into the Iraq War was unrepentant, saying that going into Iraq had, "Made the world a safer place". This is highly questionable, and it has yet to be shown that the dossier in support of the war was not doctored. In other words, some people lied. Since March 2003, when we went to war, 189 British soldiers have been killed. More of that later. We went to war in Afghanistan in October 2001, to destroy the Taliban; make it harder for Al-Qaeda, so making the world a safer place. Last month the 364th British soldier was killed. David Cameron said to Channel 4 news, "We are paying a high price for keeping our country safe, for making our world a safer place. We should keep asking why we're there and how long we must be there. The truth is we're there because the Afghans are not yet ready to keep their own country safe and to keep terrorists and terrorist training camps out of their country. That's why we have to be there. But as soon as they're able to take care and take security for their own country, that is when we can leave". A former British forces commander in Afghanistan, commenting when the 300th death had been reached, said, "The death rate in Afghanistan seems shocking. But casualties are a brutal reality of all wars. And compared to many previous conflicts the figures in this nine year campaign are low. In the Falklands we lost over 250 troops in under three months. Almost 700 British soldiers were killed during the three years of the Korean War. And on average, 178 died every single day in the six years of the second world war. Even in the Northern Ireland police action, in 1972 alone we had as many killed as in the bloodiest year in Helmand". So that's all right then. Tragic as it is, it's not as bad as previous conflicts. Sorry, this is pathetic. 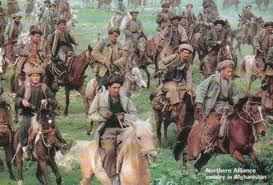 What of the people of Afghanistan? How involved are they in the decisions made affecting their country. It is said that about 90% of the opium produced in the world comes from Afghanistan. This must be destroyed so that the 'drugs problem' around the world can be dealt with. But for most people living in the rural tribal heartlands this is their only source of income. What will replace it? The answer is? It seems that nobody knows. If destruction of opium fields is a policy, then it has patently failed, for reports state that since the war began in 2001, there has been a 150% increase in Afghan opium production. A searching Blog, written by Alex Thompson, Chief Correspondent at Channel 4 News, at the time of the 300th British soldier to die says, "You will no doubt hear and read a lot today, an awful lot today, from Englishmen intent on saying that the war in Afghanistan is going well. You will hear almost nothing from Afghans. And Afghans, thanks to NATO and the Taliban/resistance/insurgents (delete as applicable to your own personal prejudice) are getting wiped out and injured far, far more than any foreign soldier or insurgent mujaheddin. Which is rather a shame. Because tragic though the 300th British dead soldier/marine is, it is the Afghan people for whom we are fighting we are told, and the Afghan people who remain resolutely ignored in what is being forced upon them and their land from the foreign occupation (and it is that for many of them, let's not beat about the bush) and their largely hated, corrupt president, downwards through the various levels of corruption and kleptocracy. All of this, by a military force which keeps telling the Afghan people that it wants to get out and run home as fast as it feasibly can". Lest you be mistaken, this Blog is not about war in general; it is about the justification for going to war in Iraq and Afghanistan, and of our continued presence there. In my simple view, the case for going in the first place, and for staying in the second has not been made, and Wootten Bassett repatriations are a stark reminder of that. Let me conclude this Blog with a comment about the cost of war, both in monetary, and in human terms. Iraq War - this had cost the UK £8 billion. In addition, the Chilcot Inquiry into the Iraq War, up to March 2010 cost £2,237,700 (official Government figures), and as another year has gone by, you can double that. Security to allow Tony Blair's first attendance at the Chilcot inquiry cost the police £273,000, and a similar amount for his second appearance (Met figures). 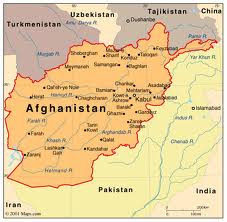 Afghanistan War - up to the latest figures, this has cost £12 billion, and rising every day. In an age when we are reducing the Government deficit, our reduced benefits, pensions, jobs and services are paying for us to continue with the war. Let's not be parochial here and only concern ourselves with our own country. Many others have suffered greatly. I've trawled the Internet sites that specifically catalogue the human cost of war, particularly those sites that try to verify every statistic. The figures are frightening, and not what you hear talked about. These are figures provided as of 3rd May 2011. So, is it all worth it? Not to me it isn't. Let me conclude with words from a 94 year old war veteran, connected with the Wootton Bassett British Legion, and who was part of the BBC documentary. "The saddest thing is that these soldiers should not be there in Afghanistan. I don't believe they are defending our country. This war is not our own - we should not be going into another nation, another culture, like this". Absolutely stunning blog Dad. I'd also like to mention America, for whom we act as political and military fodder. We must sort out that relationship and the only way to do it is to align ourselves more closely with Europe. There is also Libya. France is extremely aggressive here but it was at least passed by the UN. The world is far from safe, and Britain chooses to lead in a very violent way. There are people who wish to kill in London, New York and Madrid though and we should be in a position to address this. How much rebuilding and diplomacy could be paid for from the defence budget?